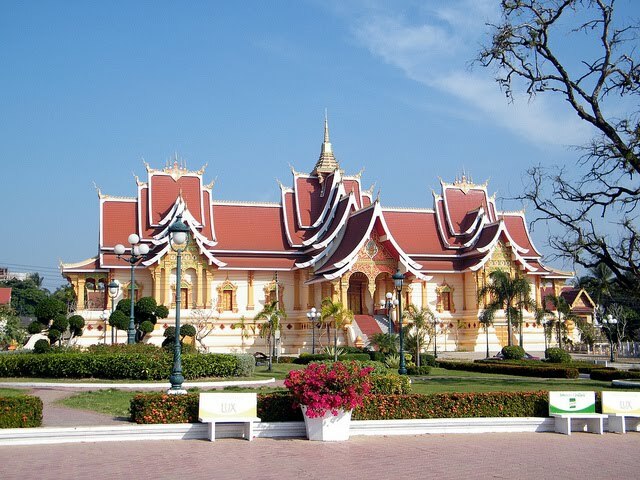 Nam Phou: A square with e fountain and lots of restaurants around in the middle of Vientiane. 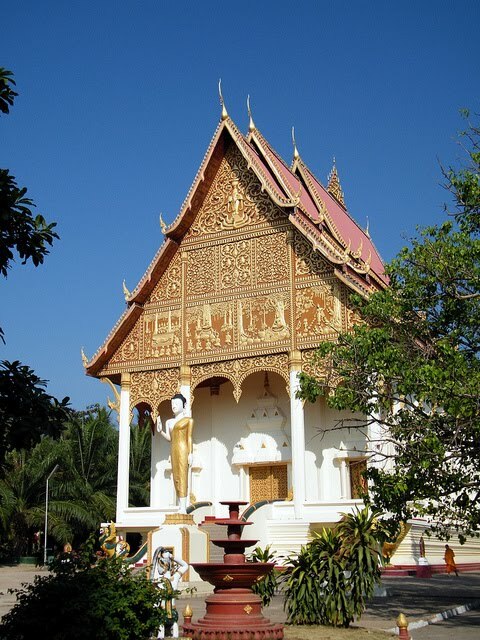 Anousavari Monument: Also: Patuxai, meaning: Victory Gate. Climb up and have a good view accross Vientiane. The monument, built between 1957 and 1968, is dedicated to those who fought in the struggle for independence from France. It looks like Arc de Triomphe in Paris, but its design is Laotian. You discover many Buddhist mythological figures like kinnari (half-female, half-bird). 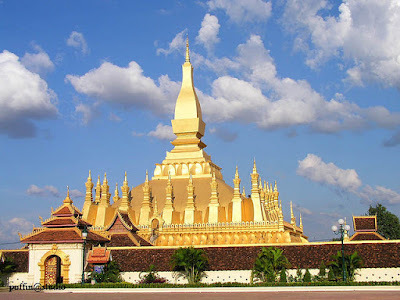 That Luang: A stupa, the most important religious monument of Laos, with 30 small stupas around and Vat That Luang Neue in the north and Vat That Luang Tai in the south. 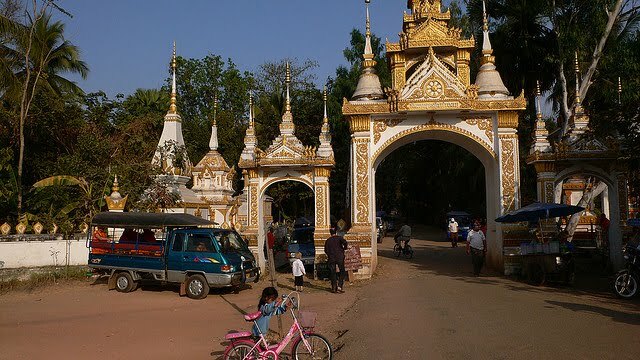 That Luang has been built by King Settathirat in 1566. During That Luang Festival (2011 from 10-12 November) hundreds of monks representing all Lao temples gather to accept alms from the people and fireworks are displayed at night. Vat Sisaket: The oldest temple in Vientiane, built by King Anou in 1818. 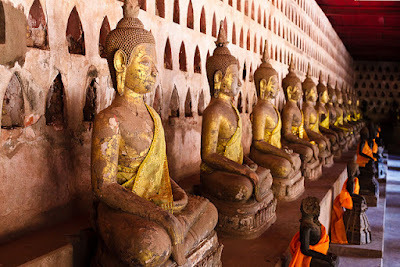 You find here more than 2,000 small Buddha statues in the niches, made of wood, stone, silver and bronze. 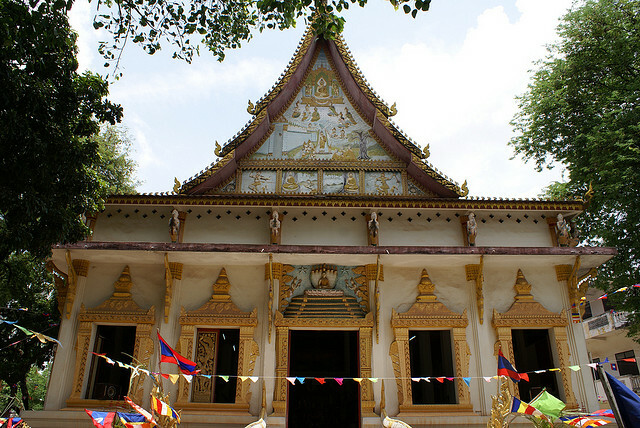 The ordination hall in the centre is decorated with mural paintings of the past lives of Buddha. Vat Si Muang: Also: Si Mueang. The sim (ordination hall) is divided into two rooms. In the front room you find usually a monk giving blessings. The back room houses the main altar. 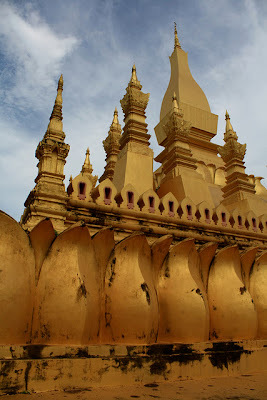 On the top of the alter you see a gilded stone - the city pillar (lak muang). 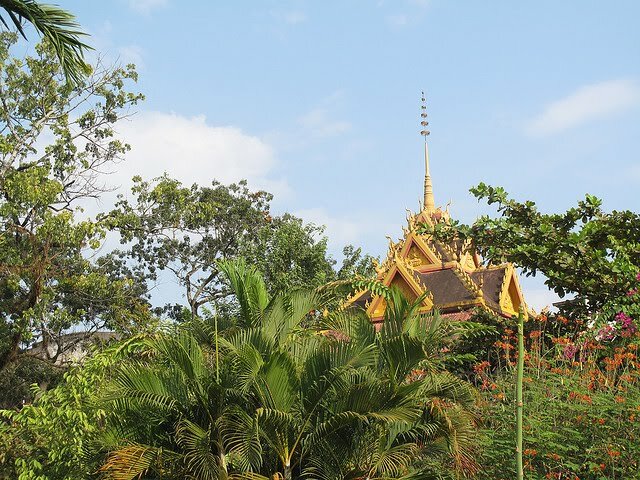 The temple was built on the ruins of a Khmer Hindu shrine, remains can be seen behind the sim. 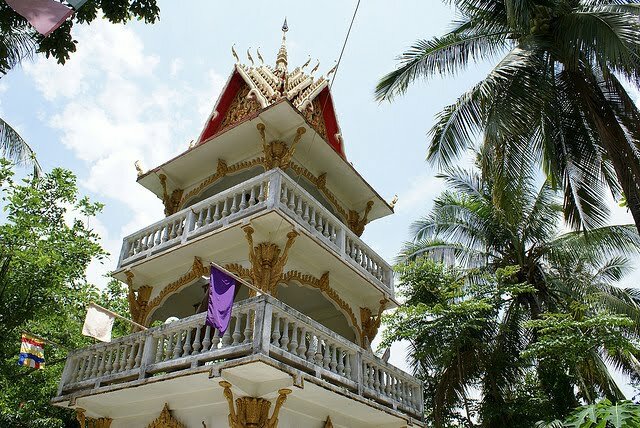 In front of the temple you see a statue of King Sisavang Vong (he ruled from 1904 to 1959). 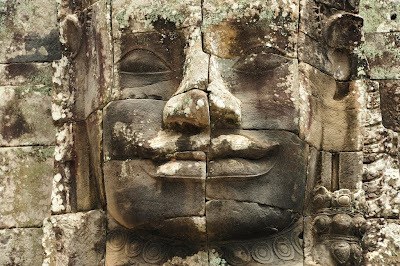 He holds a palm leaf manuscript, the first legal code of Laos. Read more about Vat Si Muang. See a video by nfsutton. 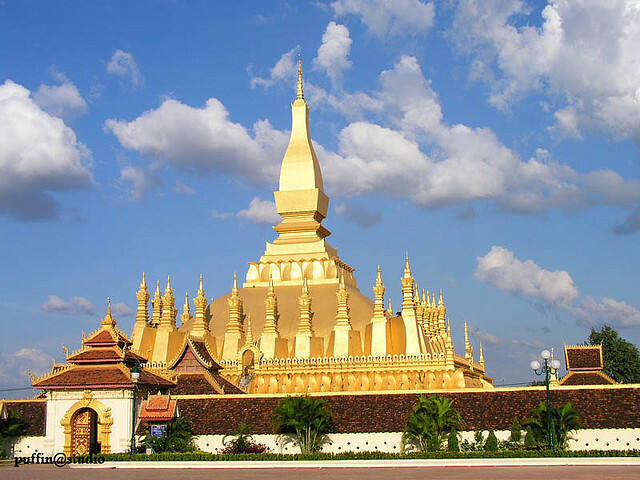 Vat Hai Sok: It has an impressive five-tiered roof, topped with elegant golden spires. The windows and facade are beautifully carved in wood. Gilded multi-headed nagas flank the steps. 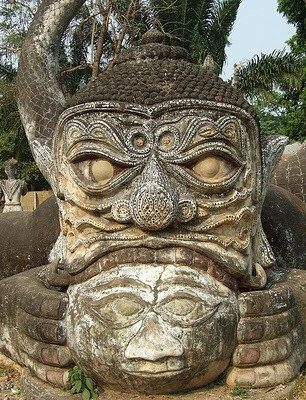 See pictures on orientalarchitecture.com, on The Guide Hog and by farida. See also the video by inranfle. 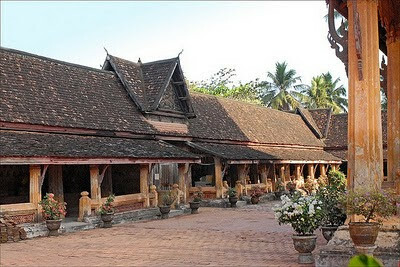 Lao National Museum: On the first floor the museum presents one of the original Jars from the Plain of Jars and various stone and bronze age implements. The second floor explains the 18th Century Laotian Kingdom. Talat Sao Mall and Market: In the corner of Thanon Lane Xang and Thanon Khu Vieng. The morning market has two floors two floors: textiles, electronics and watches on the first, clothing, gold, and jewelery on the second floor. Talat Sao Mall has three floors, escalators, some cafés and a food court. See more pictures by mmm-yoso!!! 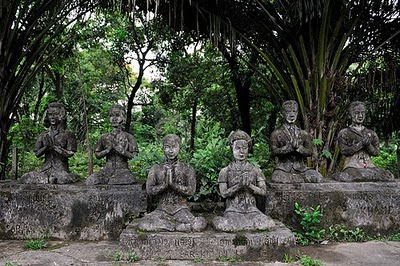 Xieng Khouan (Buddha Park): 24 km south of the town centre, off Thanon Tha Deua. Open from 8 am to 4.30 pm. 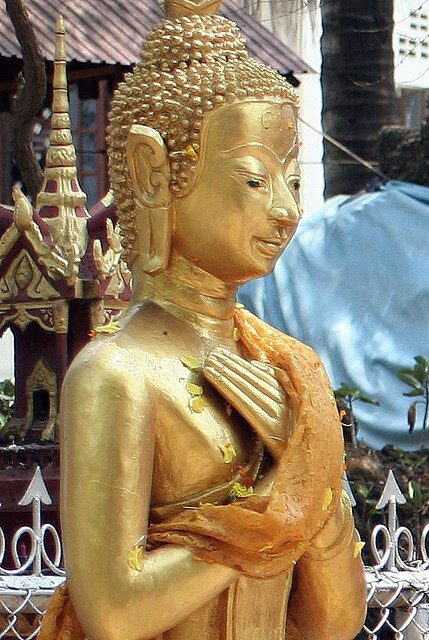 Luang Pu Bunleua Sulilat, who - as priest - merged Hindu and Buddhist philosophy and had many followers. 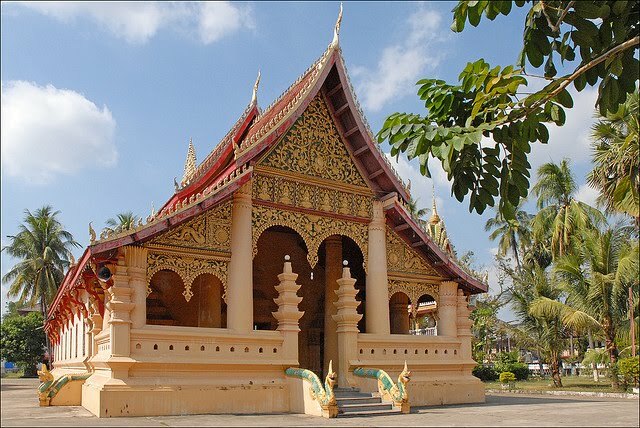 He moved to Thailand at the time of the 1975 Lao revolution. In 1978 he realized the same kind of park at Wat Khaek in Nong Khai. A concrete monument in the grounds of Buddha Park has three levels with interior spiral stairs. The three levels represent hell, earth and heaven. Buses with the direction Xieng Khuang depart every half and hour from Talat Sao terminal. 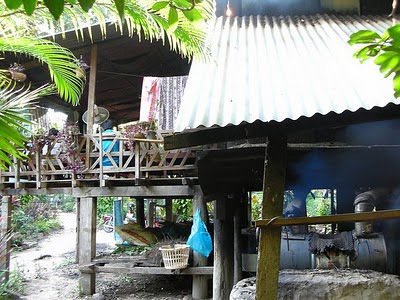 Herbal sauna at Vat Sok Pa Luang: Also: Luong. This forest temple is in Muang Sisauanak and well known for its herbal sauna and massage. For the sauna you get a sarong-like loin cloth. When you come out you are supposed to drink herbal tea and not to wash off the perspiration for at least several hours - some say six- to allow the herbal steam to soak into you pores. Read more about this sauna experience of Daniel Haber. The sauna is open from 1 to 8 pm. Read also the experience of bohemiantraveler.com. The nearby Wat 51 Amphon (Thanon Si Amphon) also does herbal saunas. Wat Sok Pa Luang is also known for its course of instruction in vipassana (Buddhist meditation). 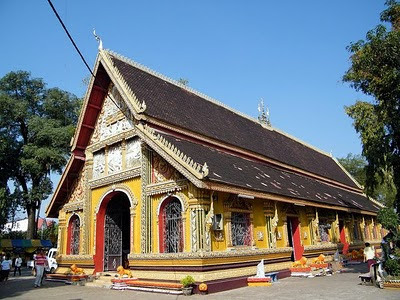 The abbot and teacher is Ajahn Sali Kantasilo, a Thai who came to Laos. The steam for the sauna is produced by a wood-fire.